Birthday cakes, anniversary cakes and celebration cakes in Kingston Brisbane. To order cakes for Kingston area please contact me. Visit the Design Range page to see more birthday, anniversary and special occasion cakes for Kingston Brisbane. 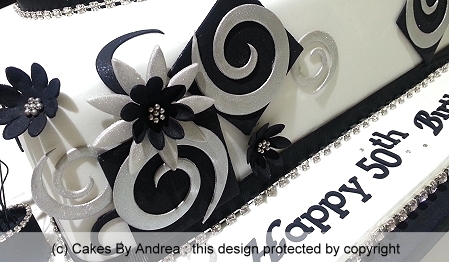 His and hers 50th birthday cake featuring geometric swirl design and stylised blossoms with birthday inscription on fondant covered board, finished with combination of black and diamante ribbons.